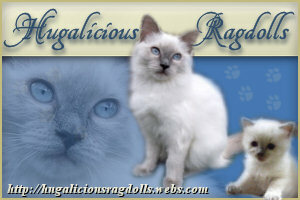 Hugalicious Ragdolls is a QICC registered prefix and is located near Ipswich, Qld. My name is Angela and I have spent much of my life raising and caring for animals. When I was in my late teens, I was a foster carer for Ipswich Animal Aid, taking in surrendered puppies and kittens and caring for them until they found permanent homes. Then, my interests turned to Australian Wildlife. I was a wildlife carer for 10 years, and have handraised many native animals, including various birds, possums, flying foxes, kangaroo joeys, reptiles and more....all in my home. I am also raising two daughters, who I have managed to help make it to teenagers. Breeding Pedigree cats is a long time dream, although, initially, I wasn't sure which breed I would choose. After visiting many cat shows, and observing many different breeds, Ragdolls became an obvious choice for me. I was smitten with not only their stunning looks, but their purrsonality and loving traits told me that this was the breed for me. I was initially planning to get a shorthaired breed, as I already had a pet Persian and an Exotic. Having arthritis in my hands, I didn't want the high maintenance of more longhaired cats, so you can imagine my delight when I discovered the Ragdolls with their beautiful, long and lustrous coats that were low maintenance. So low maintenance in fact, that the only time they really need to be brushed is in preparation for a show. They do enjoy a bit of brushing in between shows though. Ragdolls are such wonderful, sweet loveable cats. They have very soft voices. At the moment, we have two breeding girls, a lovely Blue Point, CH XOXO Buttons and Bows (Rebel), and her delightful daughter a beautiful Blue Bi-Colour, CH Hugalicious Blue Bayou (Poppy).They are both Champion Show Cats. Our kittens are raised underfoot in our home, not in an outside cattery, which ensures they are well socialised and used to the usual household sights, smells and sounds. Our aim is to produce exquisite kittens that make fantastic, family pets. It is regarded as an honour if you would like to show a Hugalicious kitten, therefore the price for a show quality kitten is the same as a pet quality. Show quality have specific standards that they must meet, and are less commonly available, so please let me know if you intend to show your kitten. Here is 5 month old Poppy enjoying a walk on her lead in the garden. Hugalicious Ragdolls has a Facebook Page - Click Here to follow and keep up to date with our news and new arrivals.